Would it be possible to have a "tag suggestion" when users post a latex or tex question without a major language tag that points them to post on TeX instead. Inevitably, questions that are only about LaTeX (and not about, for example, creating a LaTeX document from r and knitr) are much better suited to the TeX StackExchange than to StackOverflow (and are eventually migrated there anyway). Questions that are exclusively about TeX, LaTeX, and related typesetting systems are more appropriately asked on TeX unless they involve a broader programming problem. There's no easy way to check for the presence of these tags without another tag, so this'll just pop up every time someone uses them now. C'est la vie. Not the answer you're looking for? 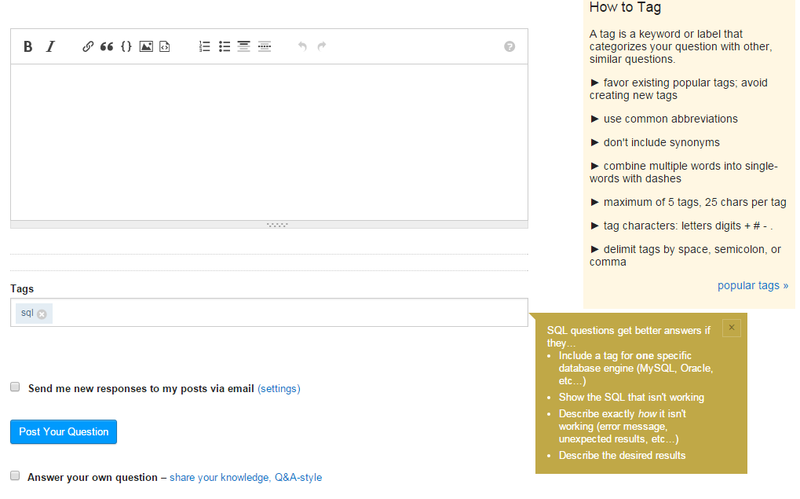 Browse other questions tagged feature-request status-completed tags asking-questions tag-tips . Would a pop-up whenever using [latex] be beneficial? Close vote hammer for migrations?